Olga Peretyatko was in glorious voice for her captivating recital at La Scala. Beautiful on both the eye and the ear she charmed throughout her highly demanding and lengthy programme, bewitching the audience for more than two hours. Olga Peretyatko was in glorious voice for her captivating recital at La Scala. Beautiful on both the eye and the ear she charmed throughout her highly demanding and lengthy programme, bewitching the audience for more than two hours – people headed toward the exits at 10.40pm after an 8pm start. A mixed programme offered three settings of Gretchen’s (or Margarete’s) soliloquy from Goethe’s Faust: Schubert’s Gretchen am Spinnrade, Verdi’s Perduta ho la pace, and Glinka’s Marguerite’s Song. There were also groups of songs by Fauré, Clara Schumann and Liszt, and after the interval an all-Russian selection which found the soprano from St Petersburg on home territory. Peretyatko’s richly coloured voice boasts an easy lower register, yet she takes it effortlessly into the stratosphere. Only occasionally was the coloratura, that made her name, on show — that was left for the encores. She sculpts each phrase, each note, with care, and her impressive technique allows her to choose graduations from fortissimo to pianissimo on every note across her wide range. Liszt’s Oh! quand je dors was delicately spun, and Schumann’s setting of Rückert’s Er ist gekommen in Sturm und Regen was intense and dramatically convincing. She performed the sixth of Tchaikovsky’s Seven Romances (Does the Day Reign?) thrillingly and she was matched by her gifted pianist (a new name for me) Giulio Zappa. Rimsky-Korsakov’s The Nightingale and the Rose was simply and beautifully delivered, and the vocalized high-C during the closing bars was kept within the modest line of the song. Rachmaninov songs concluded the programme, with Peretyatko delivering luxuriantly long phrases during his Vocalise, and the last piece was an energetically effervescent Spring Waters which saw both performers at their best. 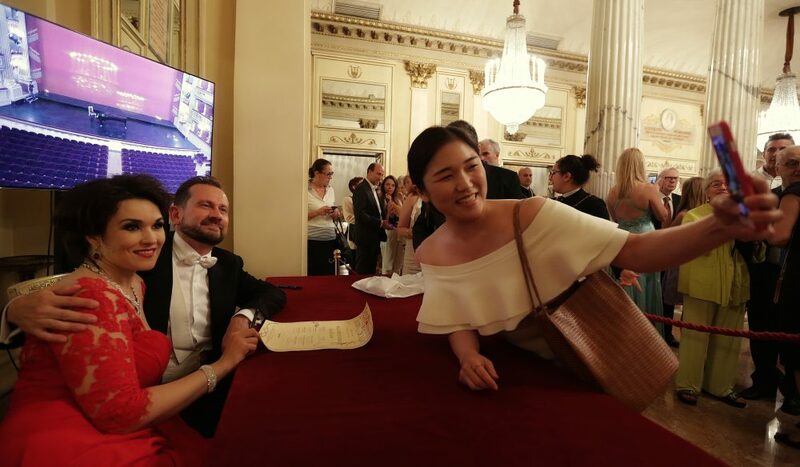 As often happens at La Scala, singers give full rein to their operatic voice during their encores, and so Peretyatko showed off her coloratura with Villanelle and Je veux vivre. Exhilarating. Niggles, I had a few, and almost too few to mention, but her delightfully expressed Fauré chansons that opened her programme showed a not very idiomatic French, yet the Gounod was spot on. Maybe the Fauré was new to her. The Schubert, too, was perhaps a new addition to her repertoire as her pianist had to accommodate some slightly late attacks. Which leads to niggle number two – the music stand! Communication with the audience is always diminished when the gaze of a singer keeps drifting down to the score and even during the Russian songs, it was there, though in her mother tongue she relied on it far less. In the encores she finally let it alone. The last encore was a brave, charming and surprising choice – Corinna’s long aria from Il viaggio a Reims. Absolute control, impressively long phrasing, gentle coloratura passages, and great intensity brought many to their feet as the audience roared their approval of this generous and gifted artist. Amusingly, the theatre had arranged an autograph session, and Peretyatko had obviously not even popped into her dressing room for a breather because we both arrived in the foyer together. I went off into the night for a relaxing drink, she was pumping hands and posing for selfies for the next hour.